The Pan Am Games have finally started in Toronto. To say that there has been little enthusiasm would be an understatement. Canada Post hasn't even bothered to issue a stamp for the event, although stamps were issued for the 1999 and 1967 Games, both of which were held in Winnipeg. There was a stamp issued for the FIFA Women's World Cup, however. the stamps are large - 40mm x 32mm or about 1½" by 1¼"
The stamps shows the cities where the matches were held and features the captain, Christine Sinclair (#12) and Kadeisha Buchanan (#14) a defender who would go on to win the Young Player Award at the 2015 Women's World Cup. The third player on the stamp is keeper Ayumi Kaihori of Japan who has been in 24 international events (according to the Canada Post website, this is 'emblematic of players coming to Canada from around the world'). This is the 31st stamp designed by Debbie Adams. We were knocked out of the quarter finals by England, who were in turn knocked out of the chance to play the gold medal game by a heartbreaking own goal in the semi finals. Germany thought positive about their win for the World Cup and had a stamp designed and printed before the final match. Five million stamps. Had they lost the final, all these stamps would have been pulped. The stamps were ordered by Germany's Finance Ministry, which holds 21% of Deutsche Post. Usually producing a stamp takes at least six months, but designer Lutz Menze was contacted by the government after the tournament had already started. 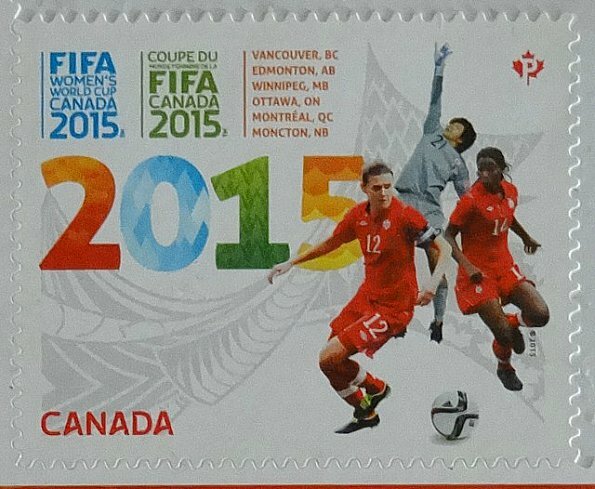 Unlike the Canadian stamp, this one doesn't show any individual players "in order to honour the whole team". Good to see a women's international sporting event on stamps. It was exciting to see these stamps and they have been very popular. I think it's better to honor a whole team than an individual player. yes. it does seem like the stamp is honouring these two Canadians (and one Japanese) players more than the women's soccer team. 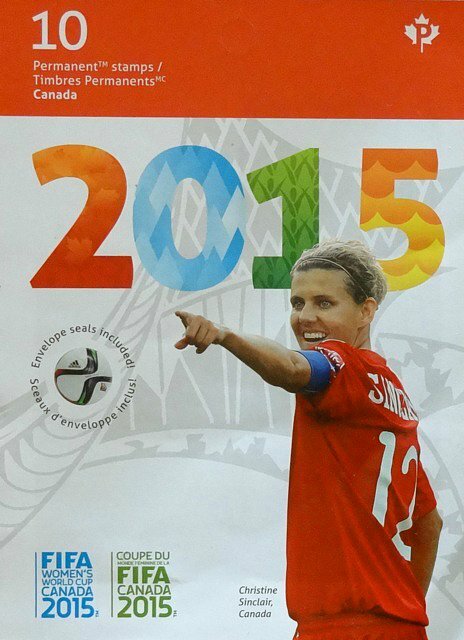 and it is well known that Christine Sinclair hates being singled out for attention. I love these stamps on women's soccer. Although I wrote on my blog that I hardly watch sports on tv, and I must confess that I missed these Women's World Cup matches, too, in general soccer belongs to one of my favourite sports-to-watch-on-tv. This Canadian stamp I hadn't seen before and is definitely one of my favourites! The other sport I love to watch is the Tour de France - though that is more for the aerial photography than the excitement of who wins each stage! I'm not one to watch any sport on TV except shooting type events however, I do love a good baseball game to watch in person and I love to play the game also. Golf is also a sport I like. Your stamps are colorful and represent the theme well. I enjoy watching golf much more than I enjoy playing it. Baseball is way, way down the list. Love those Canada World Cup stamps I spent some time watching the matches in what was the middle of the night here. "And the Germans win" is possibly common footie commentary through history no wonder they were confident in printing the stamp. So many of the stamps featuring famous Canadians have older pictures of them, so this is unusual to have a current face. I was hoping to see a stamp from the Canada World Cup. Good to see the recognition given to the players. I've been waiting to post it ever since it first came out!